Anchor Bay has released their trailer for Texas Killing Fields, a film detailing the investigation into one of the most heinous murder stories America has to offer. Though the swampland crime scenes are outside their jurisdiction, Detective Heigh is unable to turn his back on solving the gruesome murders. Despite his partner’s warnings, he sets out to investigate the crimes. Before long, the killer changes the game and begins hunting the detectives, teasing them with possible clues at the crime scenes while always remaining one step ahead. When familiar local girl Anne (Chloë Grace Moretz) goes missing, the detectives find themselves racing against time to catch the killer and save the young girl’s life. 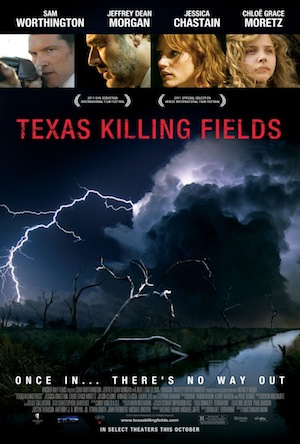 Texas Killing Fields gets a limited release this fall on October 14th 2011. Comments for The “Texas Killing Fields” Trailer Hits The Net are now closed.